“We hope that the bishops are alive, but unfortunately the world is silent and nobody has provided physical evidence,” Greek Orthodox Patriarch John X of Antioch said in a statement he read at the conclusion of the Divine Liturgy April 19 at Our Lady of Balamand Monastery in northern Lebanon, near Tripoli. 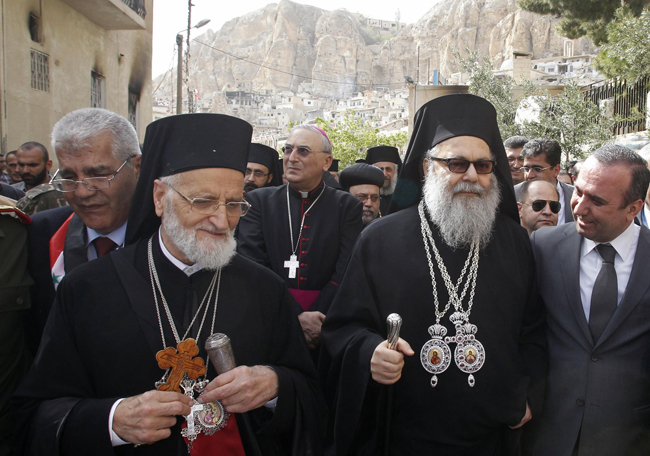 The bishops — Syriac Orthodox Metropolitan Gregorios Yohanna and Greek Orthodox Metropolitan Paul, both of Aleppo, Syria — were kidnapped April 22, 2013, in the province of Aleppo. Metropolitan Paul is the brother of the patriarch. Patriarch John called for “the whole community and international organizations to mobilize” to inquire about the fate of the missing bishops. “Our (Middle) East,” the patriarchs said, “has become an open arena for all evils.” The aim of the atrocities in the region “is to demolish life in its cradle, shatter civilizations, remove the rudiments of its landmarks, conceal its characteristics, displace man, destroy history and disfigure the identity of God,” they stated.